For too long we’ve been eating waffles with a knife and fork. While lovers of cupcakes, ice cream cones and cookies have been able to enjoy their tasty treats on the go, waffles have been a sit-down dessert. 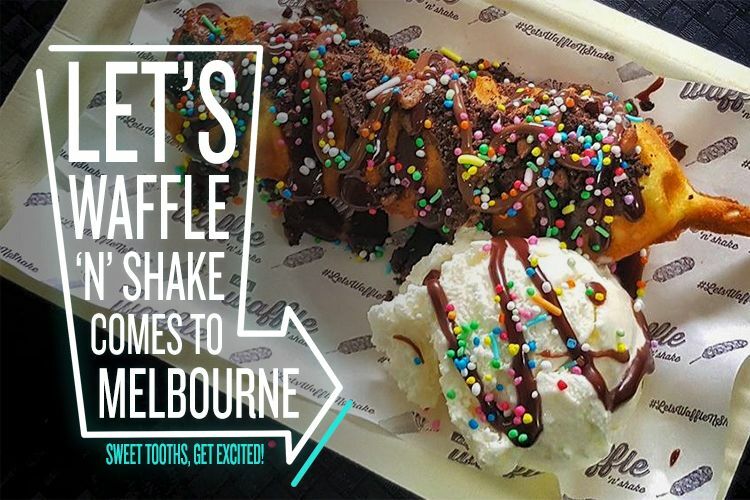 But now Melbourne’s newest food truck, Let’s Waffle N’ Shake, is set to change all that. 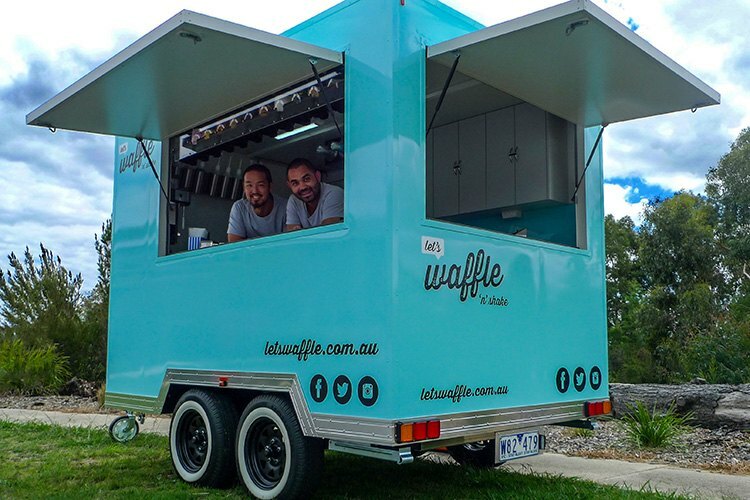 The bright blue van is the work of Ben Loke and Ari Tsiokas, and their wafflepops are revolutionising the waffle world. Crispy on the outside and fluffy on the inside, these waffles on sticks are a definite must-try. There are nine different creations, each more decadent than the last – or you can create your own. 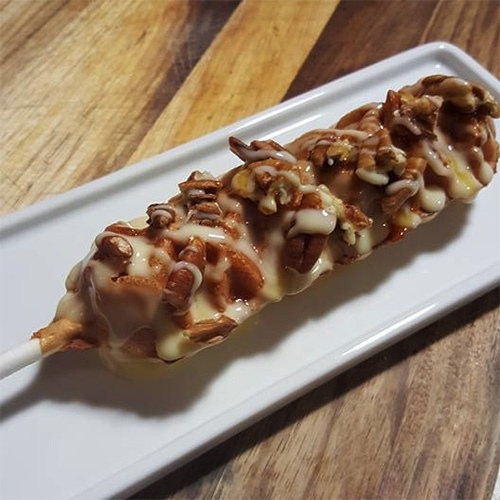 With toppings including caramel popcorn, fairy floss and marshmallow, Let’s Waffle N Shake’s tempting treats will all have you wondering where the truck have you been all my life? Their shakes are just as legendary. With classics like chocolate and strawberry for traditionalists, and more inventive additions like banana lollies and potato chips for those who want something a little different, there is something for every taste. 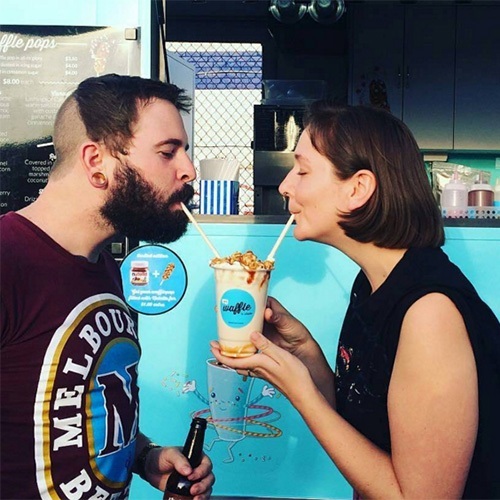 We had a chat to Ben to learn more about their fabulous food truck. Hi Ben, thanks for taking the time to talk to us. Can you tell us a bit about your background and how you got started in the food business? Let’s Waffle N’ Shake is the brainchild of two mates – me, Ben Loke, and Ari Tsiokas. Our philosophy is about treating yourself to something a little bit sweet and our vibrant blue van is as delightful as our offerings. My background is design so being in the food business is another avenue for me to be creative. I’m also a big foodie and home cook and love it. (see @blokedesign on Instagram). Where did you come up with the idea for wafflepops? 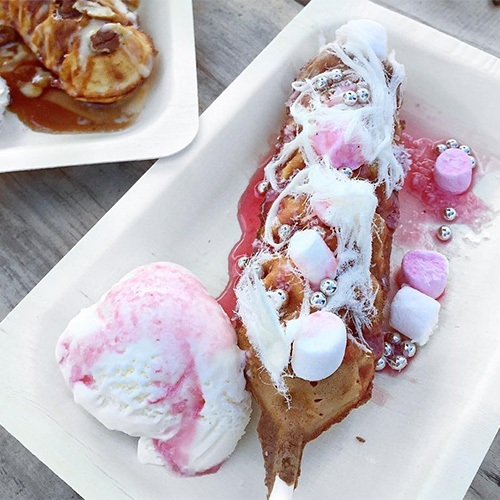 We did a bit of research into the Melbourne food truck scene and felt there was quite a large gap in the dessert space, so we played around with different ideas from crepes to waffles, and after a lot of experimenting and tasting, we decided to do the wafflepop as it was easy to eat and hold. Fudge puppies, as they are known in America, also don’t exist in Melbourne so we thought it would be a unique product to bring to the Melbourne food scene. There are so many amazing flavours to choose from, like Floss the Pink Fairy and Canadian Pecan Pie. Which is your favourite and why? I’ve always has a sweet tooth for custard, so the Canadian Pecan Pie is my favourite with a combination of maple syrup, white chocolate ganache, custard, cinnamon sugar and pecans. But the kids’ (and many big kids’) favourite is the Chocolate Party Rainbow – who doesn’t love Nutella, chocolate, oreo, coco pops, milo and sprinkles? Yep, we definitely fall into the big kid category! Where do you find inspiration for your wafflepop and shake flavour combinations? The first inspiration was when a friend came back from a trip from France and was showing me photos of éclairs and all the decadent flavours they are creating. Many of the other flavour combinations are inspired by confectionery, cakes and desserts like rocky road, banana split, pavlova, berry crumble, etc. What do you love about working with desserts? For us it was about coming up with a product that had very little wastage. We both have young families and full-time jobs – we run the food truck on the side so we aren’t out there day in day out turning over produce. The beauty of doing desserts is the long shelf life of our ingredients. Also, desserts bring a smile to people and we love doing that. We’re smiling just looking at all the amazing photos. What’s awesome about working out of a food truck? Just the flexibility and portability of it. You get to meet great people and travel to all different sort of locations and events. It’s small and cosy but we have a lot fun doing it. When you’re not indulging in your own delicious creations, where do you love to go for a great meal? Melbourne is a great place to eat; we are spoilt for choice. I love Japanese and seafood so would be more than happy to eat out at our local Japanese places Satsuki and Cafe Carpenter for Japanese and Miss Katie’s Crab Shack and Richmond Oysters for a seafood fix. 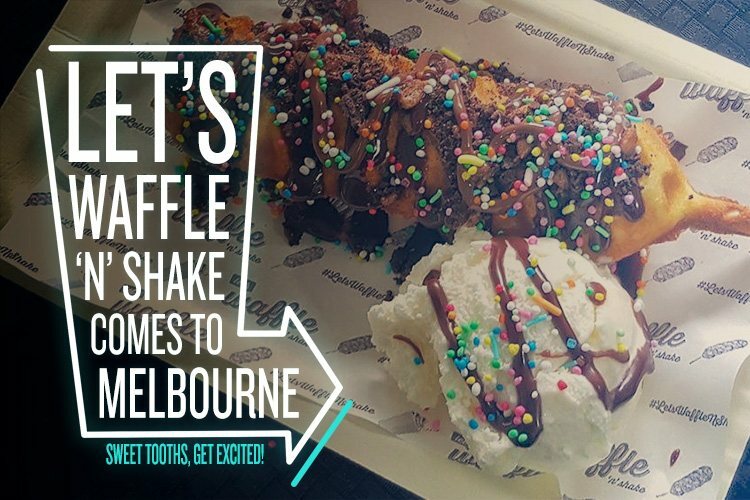 The Let’s Waffle ‘n’ Shake food truck can be found at a range of events and locations around Melbourne. Check out their website to find out where they’re headed next!